SIL Converters version 2.5 is intended to be installed using the Master setup program found here. This document is intended to guide you through the Master Installer installation screens and initial SIL Encoding Converters2.5 Setup. This guide may be sufficient for many users. However, to make full use of SIL Encoding Converters 2.5, you should refer to the SIL Encoding Converters documentation. SIL Encoding Converters2.5 Setup—Conversion applications are installed and conversion Maps and Tables are copied to your hard drive. This section is intended as a guide for initial setup. For detailed information on the SIL Encoding Converters2.5 Setup see Help for SIL Converters 2.5. You should probably choose all defaults, except if there is a Maps and Tables package that you might want to use. You do not need to know exactly what you want to install the first time you run the Setup program. You can run the Master Setup program again to add or delete components. For more information on the SIL Converters components and features see Help for SIL Converters 2.5. This screen allows you to select which conversion applications are installed and which conversion Maps and Tables are copied to your hard drive. Selected Map and Tables will need to be activated using the Converter Installer dialog latter in the installation process. When you see the SIL Encoding Converters 2.5 has been successfully installed message, click Finish to continue. This installer does not check to see if update has already been installed. 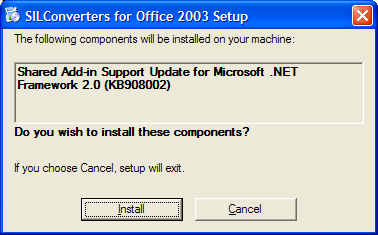 If you know the update has been installed, you may click Cancel and OK to skip this installer. The Converter Installer allows you to add the converters you want to use to the system repository of your machine. This makes them available to all applications that use Encoding Converters. This selection menu is also permanently available from: Start / Programs / SIL Converters / Launch Converter Options Installer. All conversions currently copied to your hard drive are listed. A dark check indicates conversions that are selected to be activated. No check indicates conversions that are not activated or are selected to be deactivated. Show Tool Tips: When this box is checked, hovering over the conversion name will display information on the conversion. Select the conversion you want activate. Most users will only use one or two conversions. Click Commit to activate your selections. Delete any versions of cc32.dll that may be in your C:WindowsSystem32 and C:LingLinkCellarSmv folders. If you want to use a Python script converter, such as 'UnicodeName' (installed when you select the 'Python Script Functions 2.4' transduction engine feature in the SILConverters' installer), you must also install a separately-available Python distribution of the same version number. SILConverters 2.5 supports encoding conversions using Python Version 2.4. This means you must have a Python Version 2.4.x. installed on your computer. It will not work with an earlier or later Python version (e.g. 2.3.1 or 2.5.2). As of this writing, Python Version 2.4.4 is available for download from http://www.python.org/download/. If you want to use a Perl expression converter, you must also install a separately-available Perl distribution of the same version number. SIL Converters 2.5 supports encoding conversions using only Perl Version 5.8.7. It will not work with any other Python version (e.g. 5.8.8). The Perl converter has been tested with the following freely available Perl distributions: ActiveState Perl or PXPerl. The PXPerl program inserts its path Path environment variable ahead of the Windows path folders. This causes certain problems (e.g. 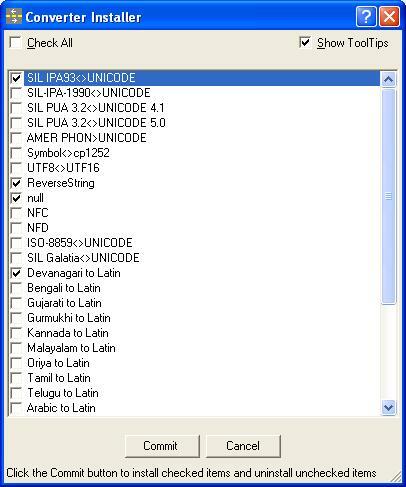 unable to add an ICU Transliterator from certain SIL Converters’ client applications). Right-click My Computer and choose Properties. Result: The System Properties dialog is displayed. In the System variables area, scroll down to and select Path and click the Edit button). Move the portion of the path that refers to Perl (e.g. C:PXPerlparrotbin;C:PXPerlbin;) to anywhere after the Windows path folders (i.e. the %SystemRoot%... items). Open a text editor like Notepad. Right after clicking Edit, click CTRL + C to copy the path statement from the Variable Value box of the Edit System Variable dialog window, then paste the path into the text editor. After editing you can paste it back.